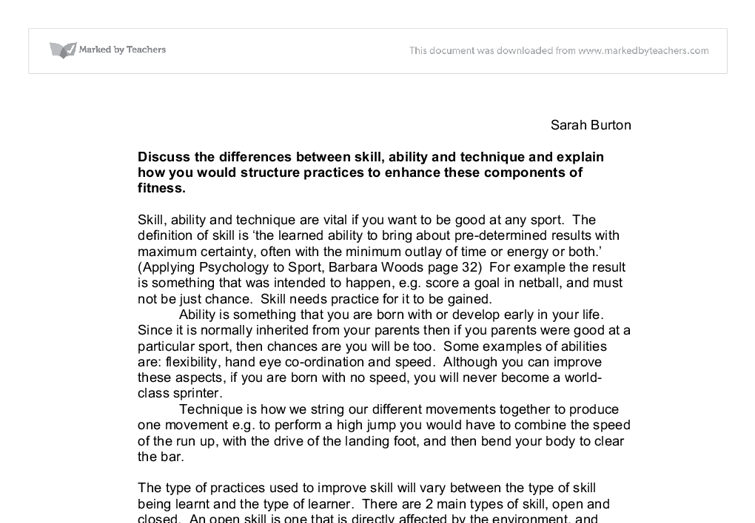 Sarah Burton Discuss the differences between skill, ability and technique and explain how you would structure practices to enhance these components of fitness. Skill, ability and technique are vital if you want to be good at any sport. 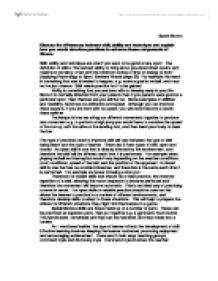 The definition of skill is 'the learned ability to bring about pre-determined results with maximum certainty, often with the minimum outlay of time or energy or both.' (Applying Psychology to Sport, Barbara Woods page 32) For example the result is something that was intended to happen, e.g. score a goal in netball, and must not be just chance. Skill needs practice for it to be gained. Ability is something that you are born with or develop early in your life. Since it is normally inherited from your parents then if you parents were good at a particular sport, then chances are you will be too. Some examples of abilities are: flexibility, hand eye co-ordination and speed. Although you can improve these aspects, if you are born with no speed, you will never become a world-class sprinter. Technique is how we string our different movements together to produce one movement e.g. to perform a high jump you would have to combine the speed of the run up, with the drive of the landing foot, and then bend your body to clear the bar. ...read more. The disadvantages are the teacher has little opportunity for the teacher to give individual feedback, and the learners wont learn to think for themselves. The discovery style is the pupil being taught by the teacher giving clues and the pupil therefore working out how to perform the skill themselves. This enhances the self-confidence of the learners, but the disadvantages are it is time consuming and needs to be adjusted for each student's ability. If the learner was fit, motivated and experienced then they would need positive and negative feedback. This type of athlete would benefit from massed practice sessions were they would have no recovery and test their skills under fatigued conditions, like they would be in a game situation. Experienced performers will then act on intrinsic feedback to improve their performance. An example of this would be a tennis practice where the coach throws balls into different areas of the court and the player is forced to play different types of shot. If the learner was less experienced then more positive feedback would be needed to keep the athlete motivated. This learner would benefit more from a distributed practice, were the practice is split up into sections. ...read more. Therefore, if a child is born with little flexibility they aren't likely to become an elite pole-vaulter. By looking at the equation we can assume that elite performers must have been born with ability, then develop their technique, so they can perform their skills at such a high level. From reading Kelly Holmes' autobiography, she proves the equation true, as she was born with natural talent, which she discovered at Primary school age, then started training, where she improved technique, then developed her skill, which allowed her to win 2 gold medals. Skills and techniques can be improved with training, the training methods used will vary whether the skill is open or closed, and the type of coaching being used, and whether the coach is teaching an individual or a group. Of course some nations will be better at some sports than others, because of their resources. For example, Switzerland has mountains and snow in winter, so it is not a surprise that they have lots of good skiers. Since England rarely gets snow, we are immediately put at a disadvantage, and a child might be born with natural ability, but never know, because they wouldn't have the opportunity to try skiing. The body type will also affect an athlete. For example, an endomorph wouldn't run a marathon, as it would be extremely challenging, and they probably wouldn't have enough determination to do it. ...read more. the ball missing the table or being returned too high giving the opponent and easy opportunity to score some more points. There is not much arm movement within the shot so closing the bat is all that is needed during the preparation phase apart from brining the arm towards to ball. In the Abdominal, I performed 20, against the National average that is average. For the Standing Vertical Jump I scored 32cm, which is a low score, I also got a low score on the Sit and Reach test, as a low score was less than 25cm, and I performed 23cm. Open Closed The chest pass is affected by the environment, and the outcome depends on the situation, such as the weather. Discrete Serial Continuous The pass as a clear begging and end, but when learning can be broken down into subroutines.